All of the settings specific to OpenAPS (that can’t be read from the pump) will live in this file, so when running the setup scripts or building your loop, you will have the preferences.json file built for the system to read, in addition to your pump profile settings. Many of these are important safety settings, with reasonable default settings, so other than described below, you likely won’t need to adjust these. If you do decide to adjust a setting, the best practice is to adjust one setting at a time, and observe the impact for 3 days. Changing multiple variables at once is a recipe for a lot of headaches and a lot of painful troubleshooting. To check your edits when you’re done, use cd ~/myopenaps && cat preferences.json When editing preferences, it’s advised to do so in terminal (not a word processor) in order to ensure ascii characters are used within your preferences file. IMPORTANT: Any variables that are not true, false, or a number MUST be inclosed in straight (not curly) quotes. 1. "max_iob": 0,              <-- Zero is a number, so no quotes necessary. 3. "curve": "rapid-acting"    <-- "Rapid-acting" is not true/false or a number, so it must be inclosed in quotes. max_iob is an important safety setting for your OpenAPS set up. Beginning with oref0 0.6.0 and beyond, max_iob is the maximum amount of insulin on board from all sources – both basal (or SMB correction) and bolus insulin – that your loop is allowed to accumulate to treat higher-than-target BG. Unlike the other two OpenAPS safety settings (max_daily_safety_multiplier and current_basal_safety_multiplier), max_iob is set as a fixed number of units of insulin. Note that, in previous releases, max_iob reflected basal insulin on board only. In determining your max_iob setting, you should consider both your typical meal bolus size and your current basal rate settings when setting this safety parameter. A good rule of thumb to start out with is for max_iob to be no more than 3 times your highest basal rate PLUS your typical meal bolus. You can start conservatively and change this setting over time as you evaluate how the OpenAPS system works for you. For people using the advanced features such as SMB (especially those using Fiasp and intending for SMB to replace meal boluses), you will likely need to increase your max_iob. When you run the OpenAPS setup script, it will prompt you to set your max_iob. In previous oref0 releases (0.4.3 or older), the set up script automatically set max_iob to 0 units. This effectively made your initial OpenAPS installation only capable of setting temp basal rates in response to BG levels that were below your target BG levels. (And if your BG level is sufficiently below your target BG level, OpenAPS will set a 30 min. temporary basal rate of 0u/hr., which is often referred to as a “low glucose suspend”.) Again, you can start conservatively and change this setting over time as you evaluate how the OpenAPS system works for you. The setting you choose during the setup script will be saved in the oref0-runagain script and can be used again if you need to rerun the script. This is an important OpenAPS safety limit. The default setting (which is unlikely to need adjusting) is 3. This means that OpenAPS will never be allowed to set a temporary basal rate that is more than 3x the highest hourly basal rate programmed in a user’s pump, or, if enabled, determined by autotune. This is another important OpenAPS safety limit. The default setting (which is also unlikely to need adjusting) is 4. This means that OpenAPS will never be allowed to set a temporary basal rate that is more than 4x the current hourly basal rate programmed in a user’s pump, or, if enabled, determined by autotune. max_daily_safety_multiplier and current_basal_safety_multiplier work together, along with your pump’s max basal rate safety setting (set on your pump in the “Basal” menu under “Max Basal Rate”). 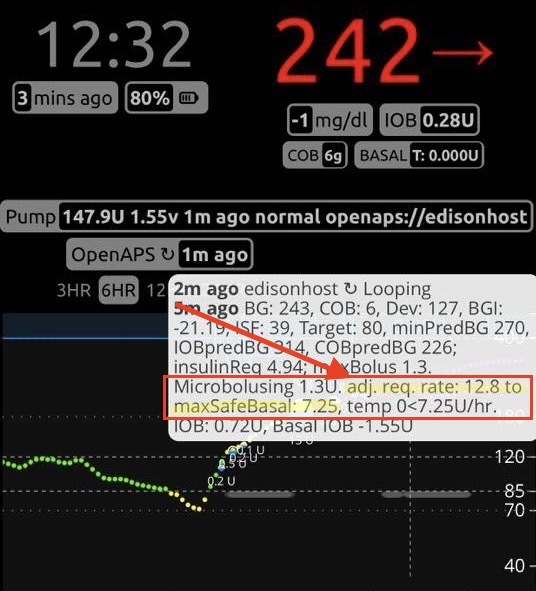 If the temporary basal rate setting recommended by OpenAPS (as determined in oref0/lib/determine-basal/determine-basal.js) exceeds maxSafeBasal, maxSafeBasal is used instead. In Example 1, the user’s max basal safety setting is the constraining limit on the OpenAPS recommended temp basal rate. In Example 2, 4x the user’s current basal rate is the constraining limit on the OpenAPS recommended temp basal rate. In Example 3, the user’s current basal rate is at his/her highest programmed rate, but none of the safety constraints are binding; the OpenAPS recommended temp basal rate is delivered. In Example 4, 3x the user’s highest programmed basal rates is the constraining limit on the OpenAPS recommended temp basal rate. Sensitivity, or the sensitivity ratio, refers to autosens calculation of your current, presumably temporary, sensitivity to your normal insulin basal rates. The sensitivity ratio is relative to basal rates, so when using it for ISF it is inverted. Simply put, current insulin basal rate = normal insulin basal rate * sensitivity ratio, while current ISF = normal ISF / sensitivity ratio. So, for example if autosens detects you are more sensitive to insulin, it will lower your sensitivity ratio, e.g., to 0.8. Then, when determining the basal rate, it will use the sensitivity ratio of 0.8 to calculate your corrected basal rate, as normal basal rate * 0.8 (resulting in a lower basal rate), and your ISF as normal ISF / 0.8 (resulting in a higher ISF, i.e., more BG change per insulin unit). If you are less sensitive to insulin, it will raise your sensitivity ratio, e.g., to 1.2, resulting in basal rate of normal rate * 1.2 (a higher basal rate), and ISF of normal ISF / 1.2 (a lower ISF, i.e., less BG change per insulin unit). This is a multiplier cap for autosens (and autotune) to set a 20% max limit on how high the autosens ratio can be, which in turn determines how high autosens can adjust basals, how low it can adjust ISF, and how low it can set the BG target. The other side of the autosens safety limits, putting a cap on how low autosens can adjust basals, and how high it can adjust ISF and BG targets. This feature, enabled by default, resets the autosens ratio to neutral when you rewind your pump, on the assumption that this corresponds to a probable site change. Autosens will begin learning sensitivity anew from the time of the rewind, which may take up to 6 hours. If you usually rewind your pump independently of site changes, you may want to consider disabling this feature. Many people occasionally forget to resume / unsuspend their pump after reconnecting it. If you’re one of them, and you are willing to reliably set a zero temp basal whenever suspending and disconnecting your pump, this feature has your back. If enabled, it will automatically resume / unsuspend the pump if you forget to do so before your zero temp expires. As long as the zero temp is still running, it will leave the pump suspended. grams of carbsReq to trigger a pushover. Defaults to 1 (for 1 gram of carbohydrate). Can be increased if you only want to get Pushover for carbsReq at X threshold. Rapid-acting is the default in 0.6.0 and beyond. You can change this to “ultra-rapid” for Fiasp (see here for other tips on switching to Fiasp), or “bilinear” for using the old curve. Most people prefer the rapid-acting curve over bilinear for Humalog/Novolog. Read more here to understand the differences in the activity curves. These preference should not be enabled until you’ve been looping (and running autotune) for several weeks and are confident that all of your basals and ratios are correct. Please read the oref1 section of the docs before doing so. This enables supermicrobolus (SMB) while carbs on board (COB) is positive. This enables supermicrobolus (SMB) with eating soon / low temp targets. With this feature enabled, any temporary target below 100mg/dL, such as a temp target of 99 (or 80, the typical eating soon target) will enable SMB. This enables detection of unannounced meal (UAM) carb absorption. Defaults to false. When true, always enable supermicrobolus (unless disabled by high temptarget). Defaults to false. When true, enables supermicrobolus (SMB) for 6h after carbs, even with 0 COB. Defaults to false. When true, allows supermicrobolus (if otherwise enabled) even with high temp targets. Defaults to start at 30. This is the maximum minutes of basal that can be delivered as a single SMB with uncovered COB. This gives the ability to make SMB more aggressive if you choose. It is recommended that the value is set to start at 30, in line with the default, and if you choose to increase this value, do so in no more than 15 minute increments, keeping a close eye on the effects of the changes. It is not recommended to set this value higher than 90 mins, as this may affect the ability for the algorithm to safely zero temp. It is also recommended that pushover is used when setting the value to be greater than default, so that alerts are generated for any predicted lows or highs. Defaults to start at 30. This is the maximum minutes of basal that can be delivered by UAM as a single SMB when IOB exceeds COB. This gives the ability to make UAM more or less aggressive if you choose. It is recommended that the value is set to start at 30, in line with the default, and if you choose to increase this value, do so in no more than 15 minute increments, keeping a close eye on the effects of the changes. Reducing the value will cause UAM to dose less insulin for each SMB. It is not recommended to set this value higher than 60 mins, as this may affect the ability for the algorithm to safely zero temp. It is also recommended that pushover is used when setting the value to be greater than default, so that alerts are generated for any predicted lows or highs. Defaults to false. When true, > 105 mg/dL high temp target adjusts sensitivityRatio for exercise_mode. This majorly changes the behavior of high temp targets from before. Defaults to false. When set to true, raises sensitivity (lower sensitivity ratio) for temp targets set to >= 111. Synonym for exercise_mode. The higher your temp target above 110 will result in more sensitive (lower) ratios, e.g., temp target of 120 results in sensitivy ratio of 0.75, while 140 results in 0.6 (with default halfBasalTarget of 160). Defaults to false. When set to true, can lower sensitivity (higher sensitivity ratio) for temptargets <= 99. The lower your temp target below 100 will result in less sensitive (higher) ratios, e.g., temp target of 95 results in sensitivy ratio of 1.09, while 85 results in 1.33 (with default halfBasalTarget of 160). Set to a number, e.g. 160, which means when temp target is 160 mg/dL and exercise_mode=true, run 50% basal at this level (120 = 75%; 140 = 60%). This can be adjusted, to give you more control over your exercise modes. Defaults to 15. This sets the minimum time between SMB Pushover alerts. Defaults to "carb". This sets the type of SMB alerts desired. Options are "both", "insulin", or "carb". Setting pushover_only to insulin prevents SMB from sending carb required alerts when SMB thinks additional carbs are required to bring eventual BG up. Setting pushover_only to carb prevents SMB from sending insulin required alerts when SMB is hitting maxBolus (see warning in Pushover setup section). Setting pushover_only to both allows SMB to send both insulin required and carb required alerts. Defaults to "none". This sets the alert sound played on the user device. Valid options are available at https://pushover.net/api. Defaults to 0. This sets the Pushover priority. Valid options are -2, -1, 0, 1, and 2. -2 generates no notification/alert. -1 always sends a quiet notification. 0 triggers sound, vibration, and an alert according to the user’s device settings. 1 displays a high-priority alert and bypasses the user’s quiet hours. 2 requires confirmation from the user. Defaults to 60. When a priority 2 alert is sent, the alert will sound every pushover_retry seconds until the user acknowledges the alert. Defaults to 600. When a priority 2 alert is sent, the alert will sound every pushover_retry seconds until the user acknowledges the alert or pushover_expire seconds passes. After pushover_expire seconds, the alert will be cancelled. Generally, you won’t need to adjust any of the preferences below. But if you do wish to change the default behavior, you can add these into your preferences.json to do so (or use oref0-get-profile –updatePreferences to get the full list of all preferences added to your preferences.json). This is used to allow autosens to adjust BG targets, in addition to ISF and basals. This feature was previously enabled by default but will now default to false (will NOT be enabled automatically) in oref0 0.6.0 and beyond. (There is no need for this with 0.6.0). This feature lowers oref0’s target BG automatically when current BG and eventualBG are high. This helps prevent and mitigate high BG, but automatically switches to low-temping to ensure that BG comes down smoothly toward your actual target. If you find this behavior too aggressive, you can disable this feature. If you do so, please let us know so we can better understand what settings work best for everyone. Defaults to false, so that OpenAPS will set temps whenever it can, so it will be easier to see if the system is working, even when you are offline. This means OpenAPS will set a “neutral” temp (same as your default basal) if no adjustments are needed. If you are a light sleeper and the “on the hour” buzzing or beeping wakes you up (even in vibrate mode), you may want to turn this to “true” to skip setting neutral temps. However, we recommend leaving neutral temps enabled for most people who will be using this system on the go and out of constant connectivity. Note: if set to true, in order to reduce notifications at the top of the hour, it will also attempt to cancel temp basals (unless BG or minGuardBG is below threshold and a zero-temp is needed) prior to the top of the hour. Normally a new temp basal will be set (if still needed) after the top of the hour, but that may be delayed if the rig has issues connecting to the pump. People who want to minimize the ‘on the hour’ temp basal notification beeps/vibrations may choose to accept that risk and choose to set skip_neutral_temps to true. Bolus snooze is enacted after you do a meal bolus, so the loop won’t counteract with low temps when you’ve just eaten. The example here and default is 2; so a 3 hour DIA means that bolus snooze will be gradually phased out over 1.5 hours (3DIA/2). This is a setting for default carb absorption impact per 5 minutes. The default is an expected 8 mg/dL/5min. This affects how fast COB is decayed in situations when carb absorption is not visible in BG deviations. The default of 8 mg/dL/5min corresponds to a minimum carb absorption rate of 24g/hr at a CSF of 4 mg/dL/g. This is another safety setting that may be useful for those with secondary caregivers who aren’t dedicated to looking up net IOB and being aware of the status of the closed loop system. The default is 1 (i.e. do not adjust the carb ratio; off). However, in the secondary caregiver situation you may want to set a higher carb ratio to reduce the size of a manual bolus given at any time. With this ratio set to 1.1, for example, the loop would multiple the carb inputs by 10%, and use that number to calculate additional insulin. This can also be used by OpenAPS users who rely on the bolus wizard to calculate their meal bolus, but who want to only bolus for a fraction of the meal, and allow advanced meal assist to high-temp for the rest. This is the amount of the maximum number of carbs we’ll assume will absorb over 4h if we don’t yet see carb absorption. This is the fraction of carbs we’ll assume will absorb over 4h if we don’t yet see carb absorption. The default of 0.5 for this value keeps autotune ISF closer to pump ISF via a weighted average of fullNewISF and pumpISF. 1.0 allows full adjustment, 0 is no adjustment from pump ISF. Default hotspot network name is the rig name; default password is “#OpenAPS” (no quotations). Defaults to false, which means by default only the low end of the pump’s BG target range is used as OpenAPS target. This is a safety feature to prevent too-wide targets and less-optimal outcomes. Therefore the higher end of the target range is used only for avoiding bolus wizard overcorrections. Use wide_bg_target_range: true to force neutral temps over a wider range of eventualBGs. SAFETY WARNING: If the pump has a target range high end set lower than the BG input into the Bolus Wizard, the Bolus Wizard will add insulin to cover the carbs as well as bring BG down to the high end. I.e. if your high end is 110 and you enter a 160 BG and 45g of carbs in the Bolus Wizard, the Bolus Wizard will dose 1U to bring BG to 110 and 3U for carbs (assuming 50 (mg/dL)/U and 15g/U factors). The rig will likely have already dosed insulin to bring your BG to your low target, and you are potentially “double dosing”. In these scenarios, you will have too much insulin onboard and can experience a severe low. If you use the Boluz Wizard, ensure the high end of the BG target range is a high number such as 250 mg/dL. Defaults to false. Using the pump bolus wizard to enter carbs will prevent SMBs from being enabled for COB as long as those carbs are active. Using the pump bolus wizard will prevent SMBs from being enabled for up to 6 hours by the “after carbs” or “always” preferences. If anyone wants to get around that, they can add A52_risk_enable (with the capital A) to preferences and set it to “true” to acknowledge and intentionally use that approach, which we know leads to increased A52 errors.